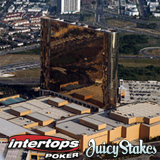 The Borgata $1m GTD is one of the biggest poker tournaments left this year, and you can qualify online with Intertops Poker and Juicy Stakes Poker. Daily satellites have started this week and will run until October 26th, and you can qualify for as little as $1.10. At least one player will end the month with a fantastic $4,200 prize package, including a seat in the Main Event (where they can play for a share of a million dollars), five nights' accommodation at the Borgata itself, and a generous $600 for travel expenses. The Main Event is part of a huge festival of poker, and last year the prizepool hit the $1.5m mark. "Last year's Main Event winner walked away with more than $350,000 so there is serious money at stake," Intertops' poker manager said. The Borgata $1m GTD Main Event comes hot on the heels of the Caribbean Poker Tour (CPT), where Intertops and Juicy Stakes satellite winners will be getting a piece of the action. The two qualifiers are blogging about their achievements, and about the upcoming CPT tournament in St Maarten, at their 'Living the Dream' poker blog. With a great selection of cash games and tournaments running all year round, Intertops Poker and Juicy Stakes Poker offer a great online experience for poker players around the world. And with a chance to qualify for one of the most exciting live tournaments of the year, it's getting even better!